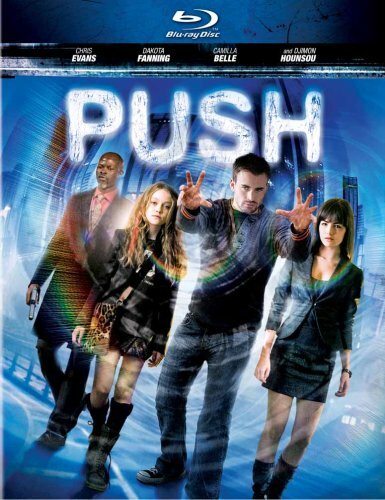 There's a terrific yarn desperately waiting to be spun on film by Lucky Number Slevin Scottish director Paul McGuigan but unfortunately instead of being captured in a cinematic tapestry in Push, you'll have to unravel it yourself in the fascinating production notes served up by its studio, Summit Entertainment. Like one of those people you meet at a party who claims to be tight with a celebrity because they saw them in a crowded airport, those behind Push like to exaggerate the idea that their film-- essentially a long version of the television show Heroes or other similarly plotted works like The 4400, and X-Men-- "is very much rooted in" truth. While of course, beginning with Nazi Germany in World War II and then in the Cold War with the United States and Russia following suit-- controversial governmental programs were created to analyze the human potential for things that scientifically cannot be explained like psychic powers and telekinesis and some of these studies became extreme-- as far as the facts go, that's basically where the knowledge ends and the ride of cinema begins for Push. The film's emphasis on truth is about as important as the opening prologue about marijuana in Pineapple Express which tries to trick you into thinking you're watching Valkyrie for a moment before the insanity begins. Yet at least in the world of Express wherein Seth Rogen's stoner witnesses a murder--the paranoia, chase and wild pursuit at least seems to make sense. Whereas when it comes to Push, I felt as though I was playing a game with a small child where the rules kept changing and instead of trying to rationalize about red now turning into blue or go meaning stop, I had no choice but to watch to see if anything made sense... and, unfortunately it never did. 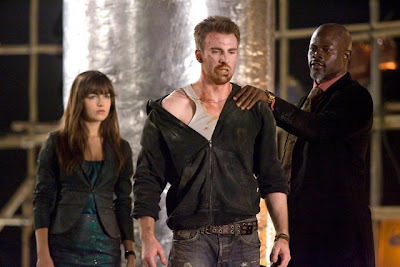 It starts out with a simple mission-- namely, get the money-- as essentially, like a Hitchockian device, the thirteen year old, rebellious Cassie Holmes (Dakota Fanning) complete with what looks like punk rock Kool-Aid dye like highlights in her blonde locks arrives in Hong Kong to enlist the help of Chris Evans' bland character Nick (so under-written, he just should've been called “protagonist”) to track down a briefcase worth six million dollars. 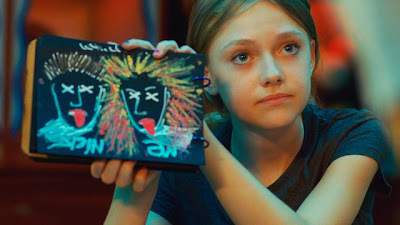 In order to find the man who didn't want to be found, Cassie uses her ability as a “watcher” which consists of seeing the future and then drawing it nonstop in sketches that are constantly changing as tiny details in the present can alter them as a ripple effect. 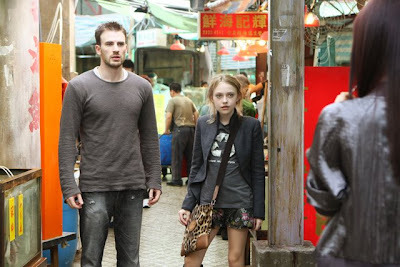 And despite the director's idea that the setting of Hong Kong works well as a 21st century version of the film Casablanca (and of course, aside from the fact that the city looks amazing on film), logically you don't have to be a watcher to find a tall, American white dude in a place he obviously wouldn't blend in. There she pleads with Nick that he should assist her because-- as a fellow second-generation psychically gifted individual-- he should therefore be able relate to her plight to save her mom since his father was brutally murdered in cold blood when he was around her age. Yet just when it seems like her trip is only going to benefit her frequent flier miles and postcard collection, he gives in eventually when Cassie hands him a lotus flower which hearkens back to a promise he made to his deceased father to help a girl who would give him such a flower. While at times the ultra stylized handling of the gorgeously photographed and edited work felt a little like “Baby Blade Runner” or “The Matrix Goes Hong Kong,” honestly I was engrossed with this plot and felt that their storyline had enough of the old vintage Hitchock like struggle to make it interesting as they began the chase for that mysterious briefcase while battling Oscar nominee Djimon Hounsou's evil "pusher." For, aside from being menacing and given of course Hounsou's easy command of every scene he's in-- his character possesses the terrifying ability of being able to "push" any thought he'd like into someone's head to make them do whatever he wants them to do. Yet then screenwriter David Bourla decided to over-complicate things... granted at first, this is done to excellent effect as we discover that Honseau's character is not just a government agent of the “Division” but the one who had murdered Nick's father in the first place. However, then things get much crazier when the six million dollar idea is cast aside and replaced with the thought that inside the briefcase are medicinal contents that work with a powerful drug that the Division has been using in their testing of those with psychic abilities to heighten their natural gifts even more. Now, why they'd need the extra boost, I have no idea since they're so powerful they can persuade someone into shooting themselves within an instant or use their mind to level guns right at the foreheads of villains without the annoyance of doing it with their own hands which is so passe. This is where the film's alleged love interest or heroine comes into play and bogs down the entire movie-- along with a few other intellectual conundrums including the aforementioned one of "just how special is special?" 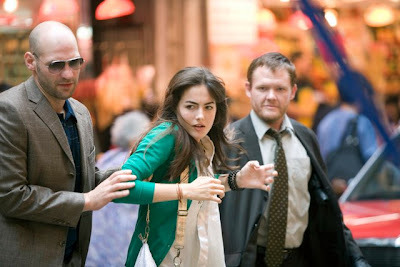 Given this horrific task is the beautiful Camilla Belle who once upon a time proved her talent in Rebecca Miller's The Ballad of Jack and Rose opposite Daniel Day Lewis before sadly she moved away from the art-house and has failed to make a movie or turn in a performance that's even remotely in the same league as that breakthrough work. Belle is tossed into the over-crowded plot as the sole powerful psychic pusher who managed to survive the testing of the drug whereas the others had perished. Escaping the Division and out on the run-- she soon joins the cause of her ex-love Nick and Cassie, only increasing the danger the two face which the filmmakers try their best to enhance all the more by adding in endless variations of other psychically advantaged or “special” (as the film describes them) types to the chase. In addition to watchers and opposing groups who also want the briefcase we meet "sniffs" who act as human dogs and smell toothbrushes and other gross objects to pick up their scent, "bleeders" who can scream so loudly they'll pop your blood vessels, "shadows" that hide buildings with their minds, and... oh hell-- essentially more characters than they have in the Clue board game that are nowhere near as memorable as Mrs. Peacock or Colonel Mustard. It's by about this point or actually right around the thirty minute mark for me, when the story began to evolve into something akin to music video madness with fetishistic costuming of miniskirts and dark clothing as everyone seems to have come straight from Fashion Week with women all sporting similar hairstyles wherein the cinematographer, editor and director must've decided that since the plot made little sense anyway, they could attempt to hide all of the flaws in its dazzling beauty which sparkles far more brilliantly in Blu-ray with hyper-real color. Yet, I still kept trying to make some sense out of the darn thing, even though Belle had zero chemistry with-- well anyone in the film... seemingly wandering in as though in need of a nap from another work and always looking like she was told she'd get a raise if she didn't smile. And additionally the plot itself started to grow stranger and stranger as the ideas of "wipers" who can erase your memory were also added into the mix. While of course, as a film critic, one wishes that perhaps wipers did exist. Although I wouldn't go as far as to wish one for this film which despite the fact that it is nonsensical and yawn-inducing is at least-- on a cinematography level anyway-- breathtaking and it's always a treat to see Fanning in anything since she always steals focus. But still, too often in Push the ingredients-- including the wipers which were taken right out of John Woo's Paycheck (although in that movie it was less cringe worthy since they were computers)-- consisted of recycled characters or plot-lines from other film and TV shows making their reality or truth based plea seem all the more ridiculous. And while the production notes boast that the filmmaker was so fascinated by the realities surrounding government study of psychic powers that he went as far as to research it on the internet (always the most reliable and highly scientific, selectively academic source!) -- the production notes by Summit which just last week released the best film of the year so far with The Hurt Locker are filled with fascinating historical information about the cases and controversies. As I read through the Push notes, I couldn't help but realize that any single aspect contained in the real, authentic research would've been much more engrossing than watching sharply dressed characters walk in slow motion and move guns with their mind or write letters with instructions to several people and somehow inexplicably not have their actions picked up by other "watchers" since, like, you know the envelopes were totally sealed. In other words, pull out the game of Clue instead where the envelope isn't sealed but the game is not only more fun but it makes far more sense.